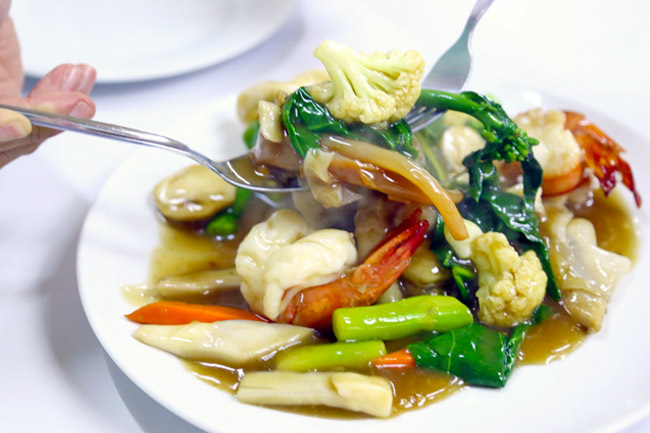 [Bangkok] In Bangkok where cheap, affordable, tasty street foods are a dime in a dozen, finding Fried Drunken Noodle (Phad Kee Mao) in a run-down no-frills eatery that is sold at 400 Baht (SGD$15.80) came as a shocker. In Singaporean-language, we call this “lok”. “Wait, isn’t that one additional zero for its usual price?” We checked, and there was no misprint in the menu. 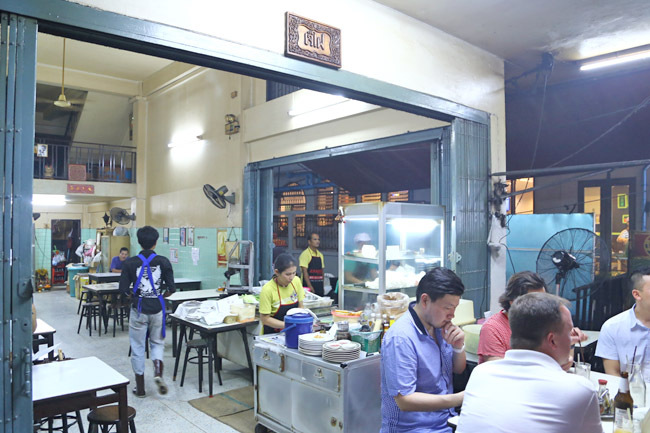 The eatery is Raan Jay Fai, run by a 70-plus year old lady known as “Sister Mole”. “Jay” represents “sister” while “Fai” means “mole”, and the name in its entirety would mean “Sister Mole Restaurant”. Chef Sister Mole stays mainly at the side where there is an outdoor kitchen, frying over blazing fires when she adds oil to twos wok on flaming charcoal. 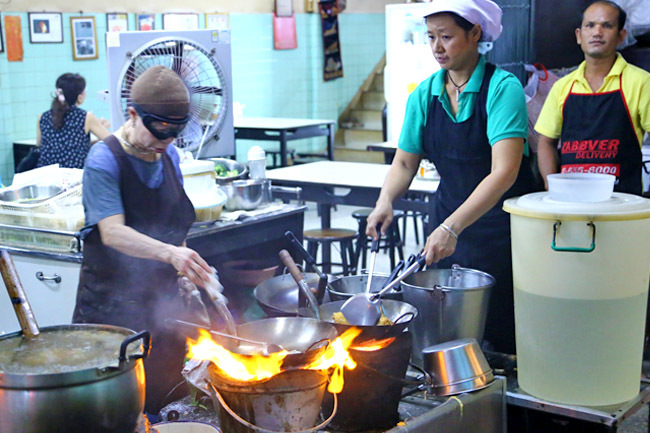 Her two assistant handle the less important work – assembling of the ingredients, as one looked thoroughly bored picking up kway teow from a container. She wore safely googles, and just went on and on stir-frying for several minutes in rhythmic fashion, seemingly one plate at the time. My friend Gavin Chan (who eats mainly atas food) said, “You MUST try the Drunken Noodles”, and he was not drunk when he told me that. 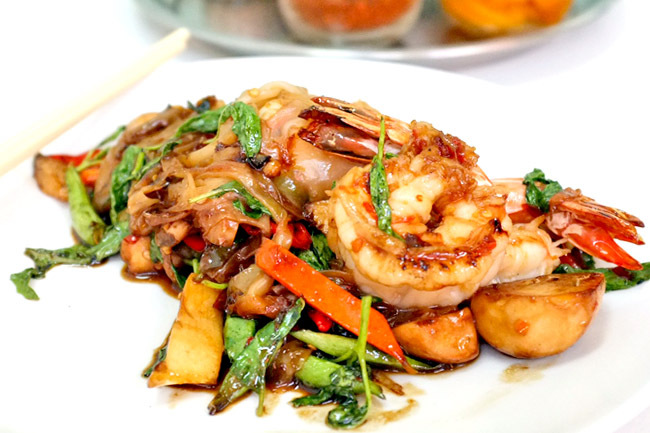 The 400 Baht plate consists of flat rice noodles fried in hot & spicy sauce, and jumbo prawns marinated in wine. Frying it over coal fire meant that the noodles had more wok hei. 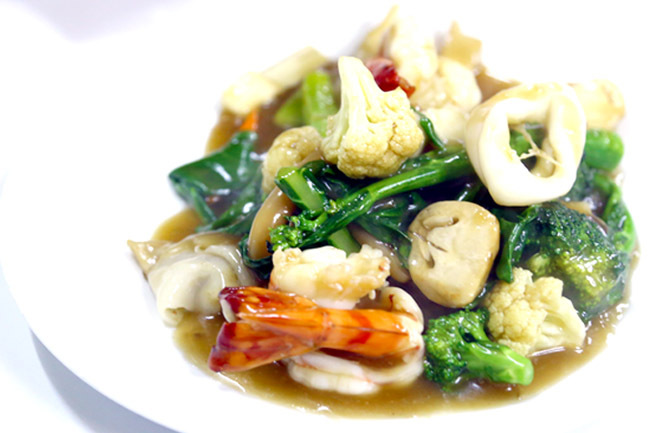 I was less impressed by the Raad Nar Goong – stir-fried rice noodles topped with mixed vegetables and giant prawns in savoury gravy. Don’t be mistaken. It was a very decent plate of rice noodles, and if this were to be sold in Singapore, there will be a long queue. I just thought it lacked of a life-changing X-factor. And so for its price… people may say “over-rated”. 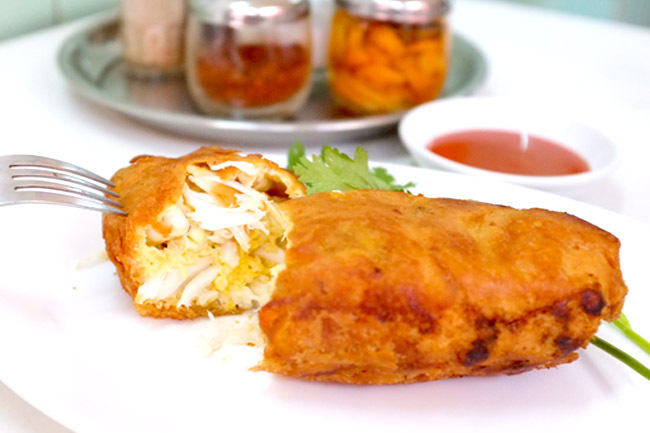 Thai Crab Omelette Kai-Jeaw Poo at Raan Jay Fai is a massive roll of egg and lump crab meat that is also fried over hot coal fire. But, but, but… take a look at the amount of lump crab meat, which is probably few crabs in one omelette. That also means eating all that sweet-fleshy goodness without a mess of picking the crab out of its shells. The easiest way to get here is via cab for tourists. 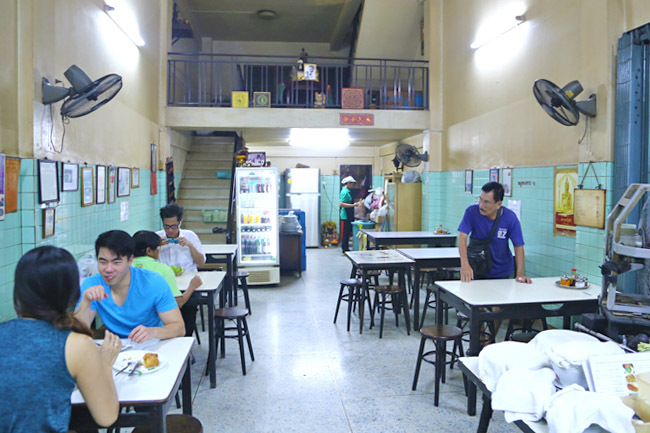 Telling the driver to get to the famous Thip Samai Pad Thai is a safer bet, and Raan Jay Fai is just a few shops down. for older sister from Chinese descent.